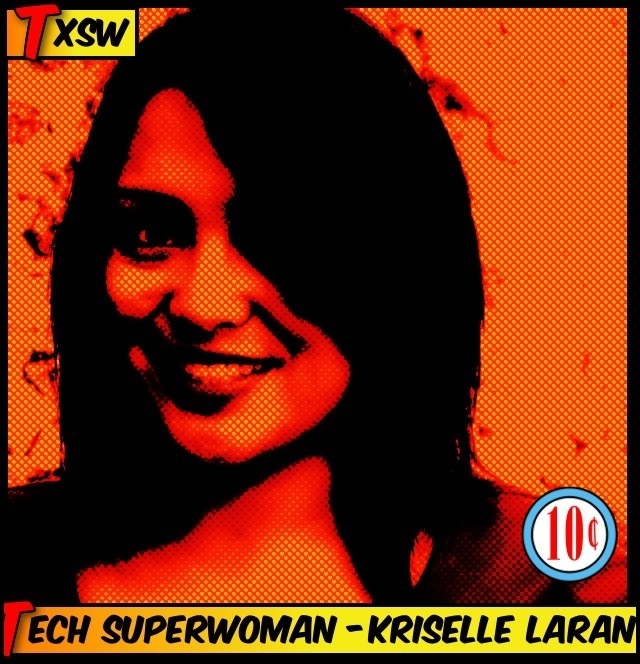 I am honored to feature a true rising star in the Tech By Superwomen profile series – Kriselle Laran. Kriselle’s advice to the #TXSW community? Cultivate patience and the ability to work with people from diverse backgrounds. Kriselle is the founder of Bullfrog Media, a full service web development and social media consulting firm in California. — David Kaplan (Eddie Kaye Thomas), How to Make it in America. Life is full of transitions and changes. I’ve learned to be more patient, adapt, and work with people of all viewpoints and backgrounds. Without these skills, I wouldn’t be successful. You should always understand a little bit about every job you delegate to someone else. Even if you don’t know how to code, or design, or put together an actual marketing plan, you should strive to understand the basics so that you can help your team to be more successful. Other people aren’t always as smart as you are, and you have to understand what you’re trying to achieve in order to help others to help you. I work a lot with the education community. I love the idea that my professional and personal lives can be brought together by putting a focus on an area that needs help being pushed forward in a very technical age. By working with the numerous schools and districts that I do, I can help market and develop products and services with them knowing that these things we create are also going to benefit my children’s educational experience. I don’t know that she realizes she is like a mentor to me. Kate Wormington, formerly of Apple, is one of the few people in my life who is an inspiration in almost every single aspect of my life. She is a marketing genius, accomplished in tech, an effective public speaker, a proven motivator, and spends almost all of her time on efforts that better the lives of not just her own children, but of the community’s children in general. She is someone that treated all others as her equals, and always strives to help make things better. Kate has pushed me to reach for higher goals. She set high expectations for me and motivated me to reach for them rather than settle for less. I don’t think that I would have the confidence I have today if I didn’t have Kate to help me see that I really could do the things I set out to if I just believed in myself more. It can be difficult to stay motivated while being challenged. The best people to work with and/or under are the people who make you feel like you want to do your best and not just check in to work each day. Although it seems like there are many women in tech, it feels like the women we hear about are mostly relegated to marketing, pr, or community management. I would love to see more emphasis on the women in actual development, as there are many, like Marissa Mayer, to whom we can look for inspiration. I look forward to seeing you at SXSW next month!